I'm sure you've already heard about essence's new limited edition - Vampire's Love. Today I was in our DM and found the display untouched. Yay! :D There are several products - a lip stain, blush gelée, an eau de toilette, five nail polishes (in our display there were only four), an eyeshadow palette, volume lash powder (I honestly don't know how that would work, but it's not really a powder, it's more like tiny fibres) and a shimmer powder. I have to admit, I wasn't really interested in most of the products, but I grabbed both the shimmer powder and one of the nailpolishes. The powder is really smooth, fine milled and firmly pressed. 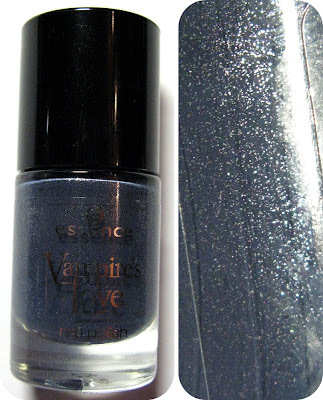 There is no chunky glitter, but a fine and subtle shimmer, which I like very much. 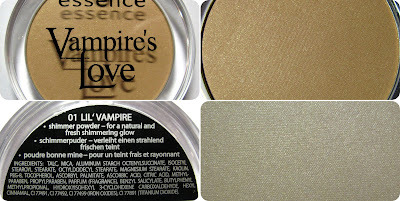 I don't know anything about how long it wears on me but I think it's a nice highlighter for little money. 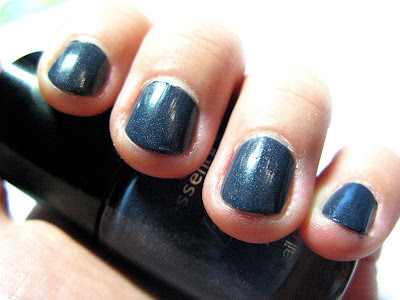 The nailpolish is a nice slate blue with fine silver shimmer in it. I only used one coat and the cover is perfect. The time for it to dry is also fine, it just took one or two minutes for it to be completely dry. Have you bought anything from this collection? Do you like the vampire theme?